contrary to what I said a few brief weeks ago, it IS possible to have too many blogs. 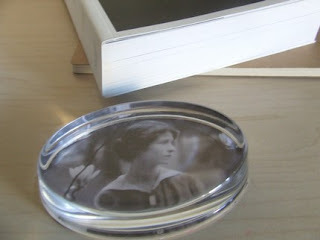 I started the dulcet blog earlier this month on a trial basis for the etsy shop. Though I've been trying to update it daily and use it as a promo tool, I'm just not feeling it. More like feeling like I have multiple personalities. The dgp blog is fine since I only use it as a news type thing, and use it to more easily list upcoming titles. But this one I felt compelled to update daily, so while I was writing there, here was looking a little lonely. I liked the look of the new blog though, so I finally upgraded my template here to be able to mess with design a bit easier. I also merged some of the posts from the other back into this one. I guess you all will just have to endure occasional gushing over girly goods and craft whoring amongst the more serious poeting discussions and cat pictures..
Poets are lazy, irresponsible and impulsive- buying lot. The easier it is to subscribe to your publication, the more subscribers you might get. in La Petite Zine #21. Another week since I last posted and again, I'm not sure where it went. Alot of it was mired in romantic drama and trauma, proof yet again that I'm an idiot when it comes to such things. Mind you, I'm not changing my ways, but things seem to have quieted down. I'm dealing with the one person who can simultaneously make me ridiculously happy and terribly sad at the very same time, so it's tricky terrain. But, then again I'm a writer, a lover of doomed romances and big sweeping plots, some would say I get off on the drama, desire beyond reason and ridiculous obstacles. And I do. I just wish the drama would stop erupting this time of year, when I am least able to deal with it mentally. In happier news, I am getting alot of things done trying not to think about the above. Yesterday, I finished an entire set of new collages, a couple paperweights, and this morning photographed everything for the shop I want to get up this week. (It's hard to get enough light in here most days..luckily there was some sun earlier.) I am putting the finishing touches on Brute Fact, still drowning in orders for both the shop and just books in general, but I am getting caught up. We are constantly running out of some titles and having to make more, so that definitely means success. We used to snicker about this line endlessly in grad school-- given her rather scandalous love life..*ahem*...but she is definitely one of my favorite poets and I've always loved this picture of her. 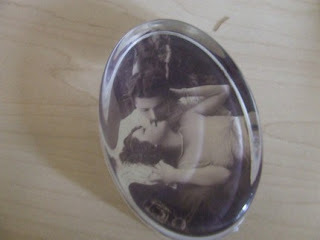 This weekend I whipped up this lovely paperweight in grateful homage. Another obsession that I'm so happy to feature in the shop are these vintage souvenir pillows. I prefer the satin, pastel colored ones, but my great grandmother when I was a kid, had a slew of the black velvet variety stacked across the back of her couch. 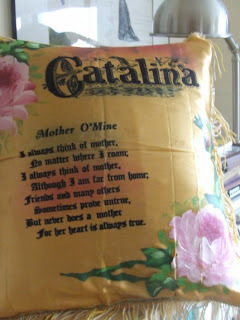 I nearly forgot about them until I was perusing ebay one day looking for vintage pillow cases and stumbled across them. Now, I'm bent of snatching up as many as I can for the shop. Amazingly, alot of them seem to be in excellent condition, and not subject to the sort of wear and tear one would expect. Some of them date back to the thirties, though alot are circa WWII. Alot of them have some rather, sall we say..um..interesting..sentimental poetry, but I LOVE the colors on them. 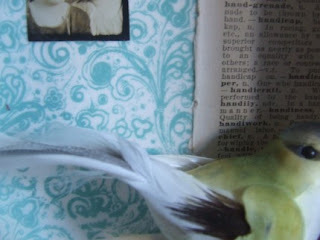 I spent the nice long three day weekend working on some new boxes, bird and otherwise. I work mostly with 2-D collage in general, but I just love the little feather birds (I have extras for sale in the shop as well for anyone feeling crafty.) 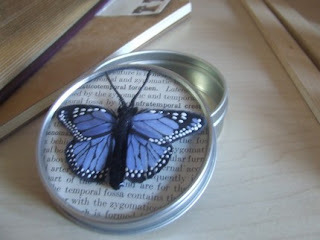 The butterflies are also fun, made of feathers, and suited these little tins I'd had laying around for awhile. Right now, I keep jewelry supplies in mine, but I think they'd look pretty on top of a desk to hold paperclips, stamps, tacks, and all those things that tend to get lost among the morass of papers. I also finished off a couple more paperweights to keep that pesky stuff under control, including my tribute to the Naughty Librarian. I have the best poetry friends EVER.. I've been posting a few new sweaters, and will be over the next couple of weeks before I move more to spring and summer wraps. I admit it, I'm a freak for cashmere..my shopping companion has actually once said to me "put the sweater down and move AWAY from the cashmere" in the middle of a Filene's Basement. There may have been some bloodshed. There's plenty for the picking vintage-wise, since they hold up so well, but since I'm a bit on the rubenesque side myself, I usually have to buy new and deeply discounted, but there are so many vintage, inexpensive lovelies out there I just had to start putting them in the shop. I mean, they look so lovely over the slips as well, and are super soft. 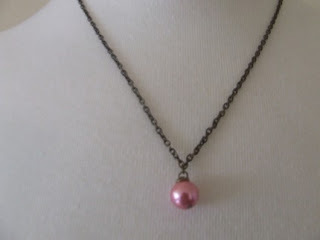 Some are really thick and luxurious, perfect for winter layering needs. 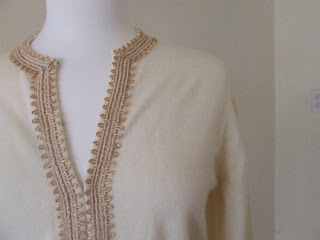 Some, like the one above, have fancy beading , trims, and details--a certain craftmanship you rarely get on clothes these days--or at least on affordable clothes for you and me. I've spent some time the last two days slightly revamping my website, which was getting way too unruly and was looking a little blah. I still like my diagrams on each page, but I wanted a little punch of color. As I talked about here, I'm obsessed with a pretty light blue going towards green, so I used that. Still somewhat neutral (and I'm a fan of neutrals) but pretty. In other random newesiness, the accepted pieces for billet doux are starting to filter in and I'm getting so excited about this project I may bust. I'm working on a hand stamp for the cover (lid) but don't have anything definitive yet. I also can't wait to show you the cover for Melissa Severin's Brute Fact, designed by artist Seth Johnson and freakin awesome. I’ve bought a woefully lot of art via etsy over the past year or so, enough indeed that I’ve run out of places to put it. 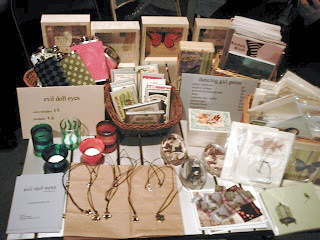 I’ve been swapping things out, putting some in frames, some in drawers, then switching them around. 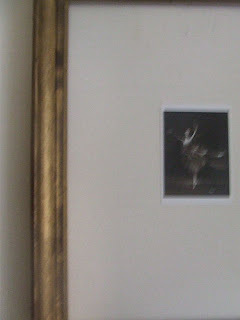 I have a few of my own collages up, as well as a couple large French Poster Art prints (another of my obsessions), and the above dancer postcard, which hangs in my bedroom. The rest are artists I’ve found on etsy, however, including bird prints from Oh My Cavalier, a bunch of photomontages by Art & Ghosts, a couple of photo’s over the bookshelf by Lightleaks, a photo by Alicia Bock on my fireplace with another woodblock print by Mlee in addition to lots of postcards by various others on my corkboard. It’s getting a little out of hand, and has now even spread to the studio, where I recently found a place for this. (Madelaine was even gracious enough to let me use it for wicked alice cover.) And who can forget Caryn Drexel's awesome cover for this book. I think we need a bigger table. I've spent a good part of the last two Sundays working on tweaking the layout for in the bird museum--a slow task since I'm such a spaz with InDesign. I'm having a weird relationship with all my work lately--there are just so many poems. bird museum, of course, feels so hugely different from the fever almanac, both in subject matter and style. girl show feels like a melding of the two somehow, but the newest stuff feels like a paring down in terms of flourish, but definitely feels more urgent. Also more personal somehow, and therefore more uncomfortable. I'm less likely to let people I know see these poems, less likely to let anyone but editors see them so far. And even then very few. I've read some of it at readings, though, and response has been good. I've decided to let things simmer for awhile before I start sending much of it out. And yet they seem easier to write but harder to claim. I'm not so much driven by narrative as in the first book, the politics of the second, the setting/mood of the third. I'm not sure what drives these poems, but it is definitely more my own experience, and in some cases, things that are happening NOW as opposed to things that have a certain amount of psychic distance. So maybe that's why they make me slightly uncomfortable. And yet I remember conversations with Arielle G last year in terms of my newer work that maybe, just maybe predicted just this sort of thing. I always find myself especially atuned to color in the winter, especially since there is such an absence of it, an unbroken sea of bare branches, brown grass, grey sky and sidewalk. Even Lake Michigan is a cold silver most days when the sun is scarce. (and that's when there isn't a coating of white snow.) Lately, there's a shade of light blue going toward green with just a touch of creme I'm in love with(I'm usually not a fan of aqua and definitely not teal). I tried to approximate it in my blog background, but it has a bit more green to it than this. 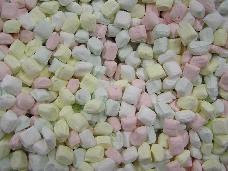 It also reminds me of those pastel party mints, but lightly richer and deeper. I tend to suffer from slight synaesthesia and if this color had a taste, it would be lightly minty, slightly buttery. It's also Marie Antoinette color--so it might taste like a rich buttercream frosting. I'll be posting more of these over the next couple of days in the shop as I finish them, including some more with milinery flowers, some with embroidery appliques, and whatever else I dream up...Since I'm a sewing machine spaz, all my hand-sewing is reminding me of my costume shop days back in college. (I usually worked in set-making, but since I was a girl they occasionally borrowed me because, apparently, they thought something in my genetics gives me a predisposition toward threading a needle.) Over the course of four years I sewed on quite a few buttons and elaborate bead arrangements and, once, latch hooked a man-sized dog costume. (Also dealt with hysterical actresses when things ripped, broke, or snagged during shows as occasional costume mistress--not pretty). 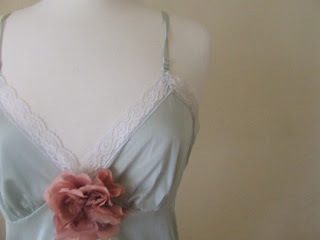 The slip dresses are MUCH easier.. This week is shaping up to even busier than usual. And of course I am procrastinating and blogging while there are about a hundred other things I should be doing. 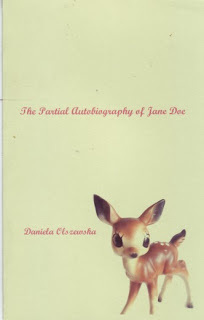 I hope to put the finishing touches on Jane Doe, update the Atelier schedule through the spring, wrangle some poets into running said programming, and answer assorted e-mails. Plus that Wicked Alice inbox for the winter issue is looking a little full. I’ve just been avoiding it. I'm aiming for mid-February on the next issue, but we'll see. And of course, as always poems to be written, subs to be sent out, ITBM to be tweaked raked over before Dusie publishes it (I am about half done due to a good part of yesterday devoted to wrasslin with Indesign, wondering, damn, why’d I write such a lengthy book--100+ pages..) And of course, the sooner that is finished the sooner I can set that little bird free out in the world. Of course lately all these things feel more like buzzing frenzied bees than a flurry of birds. Or maybe a little of both. Then again, it is 65 degrees outside today, so I really cannot complain..
*Mark Wallace talks about Something Really Wonderful..
*We've added another chap to this season..probably because we're a little bit masochistic and can't help ourselves when it comes to stellar work. And, besides, it's just one wee little series of poems, what can it hurt? 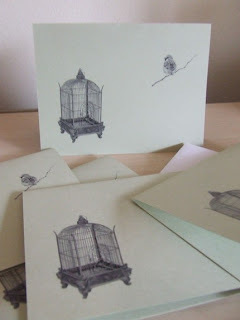 So we're happy to announce that Maggie Ginestra's short series of Darger inspired poems, Deep in the Safe House, will be squeezed into late April. 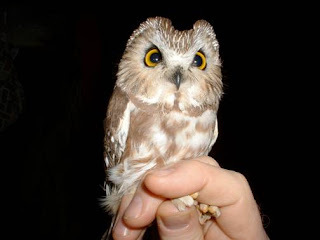 Again, I spotted one of these amidst the WA submissions and demanded she send them immediately to dgp. Check out her work in the latest issue..
*Looks like we will not only be sharing a booth with two other Chicago presses (the Switchback gals & the boys of Featherproof Books) at next year's AWP here in Chicago, but also perhaps at Printers Row this summer. Not sure how much poetry sells at something like that, where most people seem to be looking to buy John Grisham and cookbooks, but it'll be a fun thing to do nevertheless. 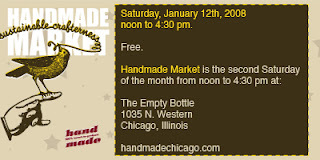 And there have to be SOME poetry readers in Chicago besides us poets, right?